Sincerely, Kinsey: Giveaway from Roots and Feathers! Giveaway from Roots and Feathers! Laura is a favorite around here on SK, so I'm sure you'll be thrilled to hear that we're bringing you a $75.00 shop credit giveaway to Roots and Feathers! Roots and Feathers is filled with beautiful, unique pieces that any bohemian at heart will adore. Laura's work has such a free spirited vibe to it, yet filled with such eye catching details and rich colors. 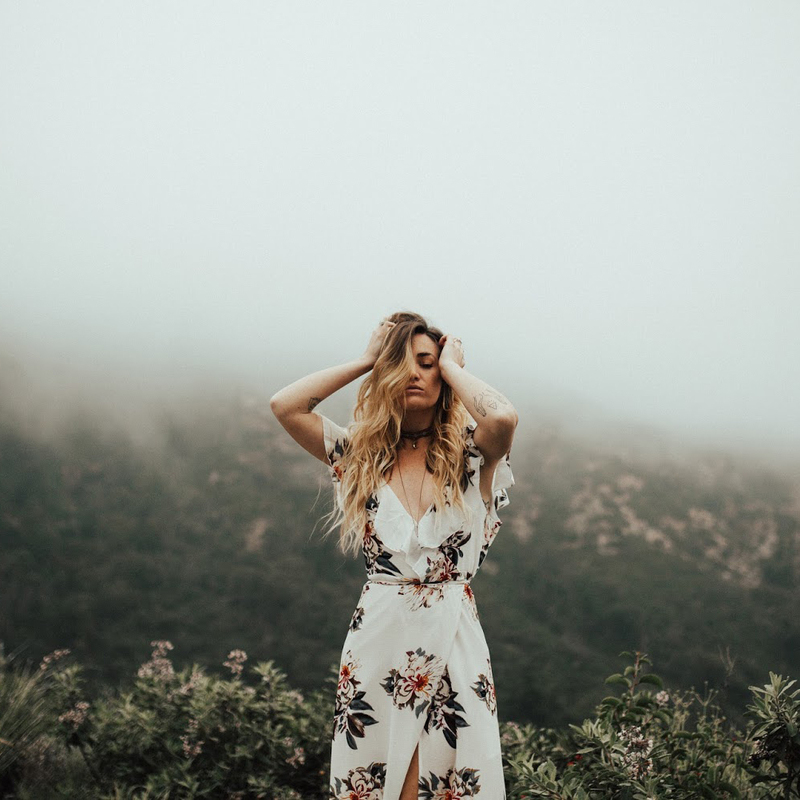 Laura recently released a bunch of new items in her shop for the Mystic Moon Lookbook. My current favorites are this, that, and this. Visit the Roots and Feathers Etsy page, and tell us what you'll choose if you are the lucky winner. "Like" the Roots and Feathers Facebook page, and let us know you've done so in a comment. "Like" the Bohemian Collective Facebook page, and let us know you've done so in a comment. This giveaway is open until 12:00 pm, Friday, December 7. The winner will be announced shortly after! Best of luck! p.s. 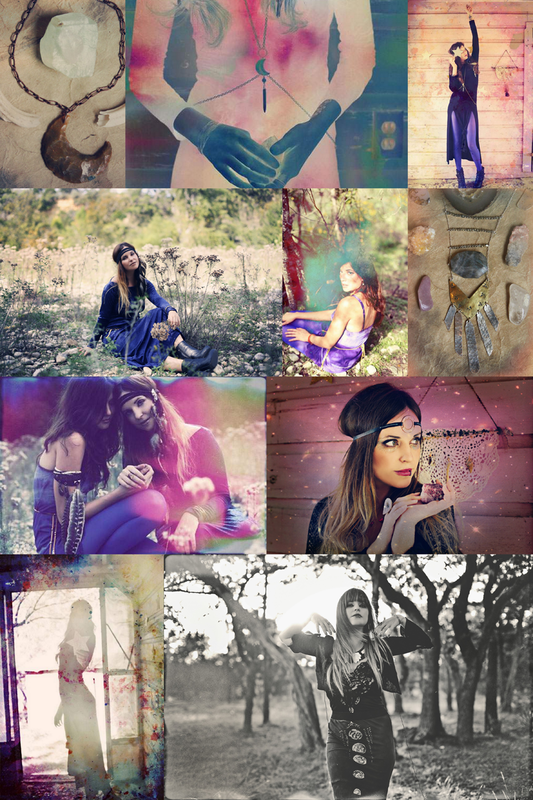 If you haven't already, be sure to check out the Mystic Moon Lookbook. I've liked both pages- everything Laura makes is so beautiful! But if I had to choose, it'd be her Aspen beaded brass arrow necklace- there's such beauty in delicate simplicity. i follow roots & feathers on facebook. i follow the bohemian collective on facebook. I just think it is positively beautiful! I also liked both facebook pages! I definitely would choose her desert body chain and ophelia dream catcher! I like her Roots and feathers fb page! And The Bohemian collective fb page as well! I also like The Bohemian Collective FB page. Thanks for the give away! I love Roots and Feather! So hard to chose! I'd pick "cosmo. a geometric arrow and astral bead necklace." I would get the doily vest! Lovely. I liked Roots and Feather on Facebook! I liked The Bohemian Collective on Facebook! I love Roots and Feathers! I've been following Laura for awhile now! And i've had my eye on the emmalye necklace for awhile. I would pick the aurora. a lunar wild woman talisman necklace....so beautiful! Liked the Bohemian collective FB page as well! Crossing my fingers on this one! I would pick the Hazel necklace in a heartbeat! Definitely would choose the beautiful cosmo necklace. love!!! I liked the Roots and Feathers page on fb! Definitely the Moonlight Warrior bodychain! Thanks for the chance! Everything she makes is so lovely. It is soooo hard to choose, but I love the sierra headband and the talyn necklace. I follow The Bohemian Collective on Fb. If I won, I would definietly get the 'Moonlight warrior' crescent moon bodychain. I've had my eye on it for a while! I would definitely have to choose either the cosmo a geometric arrow and astral bead necklacee or the mmalye a copper and gold geometric arrow necklace. They are both so beautiful! I liked the Roots & Feathers facebook page! I liked the Bohemian Collective Facebook page! I love the Emmalye necklace! Her shop is so magical! I have about 10 things on my Christmas list this year! If I won I would get the ophelia. a bohemian doily dreamcather with an arrowhead. I really like the sahara. a pair of teal and bronze hoop earrings. her shop is so cute, one of my favorites on etsy! i really love the beaded deer necklace. i have also liked roots & feathers on facebook! i have also liked bohemian collective on facebook! I love everything in the shop! One of the things I would pick is "ophelia. a bohemian doily dreamcather with an arrowhead", this is super unique! I "liked" Roots and Feathers on Facebook! The Dezba necklace is calling my name! I am absolutely drooling over the design in her new lookbook! I'm thinking I would go for the Indeylee necklace and Mandarin necklace. I like the Roots & Feathers Facebook page! I liked the bohemian collective on FB! I already like roots & feathers on FB! I love the dezba necklace & the luna & sky rings! I love the Uma earrings. I love the uma. a pair of beaded cream wooden leaf earrings and of course I 'liked' the Bohemian Collective Facebook page and Roots and Feathers Facebook page. I would find it hard to choose between Cosmo, Sady, Eagle, Lilac and Sol. They are all so beautiful!! I think at a push it would be Cosmo, Sady and Sol. Everything in the store is beautiful, thank you for showing me such a great collection of jewellery. I'd choose the Sky ring and Sahara earrings. Great giveaway! I like the roots and feathers on FB! I like the Bohemian Collective on FB! The Cosmo necklace is so pretty! i liked The Bohemian Collective on FB. I love Ophelia, Ruby, and Allie! These are amazing pieces! I like the Uma and the Rochelle earrings. So much pretty stuff there! They have such beautiful pieces! I love the chelsa necklace! I love ruby, sol, luna, eagle, and aspen. Everything is so gorgeous! It's hard to choose. I would have to pick the wren earrings. They are so simple and beautiful. I liked both pages on facebook as well. I would pick the cosmo. I loved everything though, it was so hard to choose! I also liked both pages on Facebook. The "cosmo. a geometric arrow and astral bead necklace." is lovely. Oh man, I am in serious need of some more earrings (my collection is more like a few mismatched posts and some dangly things) so I'm sorta smitten with the Nevada earrings, but could easily find about a dozen more. Well it is a million way tie but I think my current favorite is the maya earrings. I could spend hours ogling them all though. the ostara necklace, and the nevada earrings. I liked both sited on facebook! "liked" bohemian collective on FB! I would totally go for the Veya necklace! In love! Liked Roots and feathers on FB! Liked the Bohemian Collective on FB too! I like roots and feathers on fb! I Like bohemian collective on fb! veya. a feminine geometric wild woman talisman necklace is so beautiful! I would buy the bohemian doily dream catcher! I liked both pages, Roots and Feathers and the Bohemian Collection, on Facebook! Roots & Feathers is one of my top favorite Etsy stores, and I love the Cosmo necklace (http://www.etsy.com/listing/99539409/cosmo-a-geometric-arrow-and-astral-bead). I love the cosmo necklace and the periwinkle earrings! I have also liked roots and feathers on facebook! umm i need the baswell necklace! I'm obsessed with the "maise. geometric triangle necklace with turquoise and copper spikes." I liked Roots and Feathers on Facebook! I also liked the Bohemian Collection on Facebook! I love Laura, Roots & Feathers is one of my favorite blogs! I would choose the Lilac, Alla, and Isabella rings along with the Fern and Sady earrings. So many beautiful things to choose from! I would pick emmalye - a copper and gold geometric arrow necklace. If i win, I will get a necklace! I like Roots and Feathers page on facebook! I like the Bohemian Collective on facebook! Great giveaway! My favorite is the adelaine. I love the Mariella necklace! 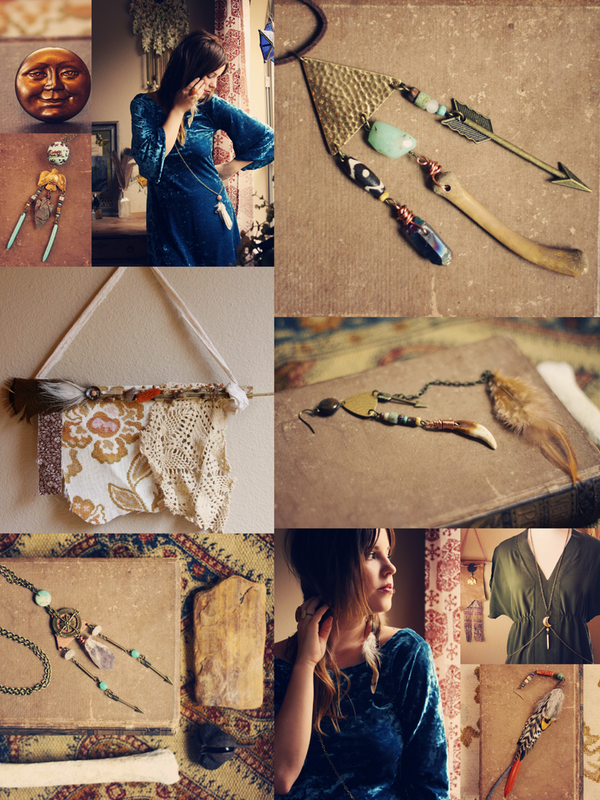 I also already like roots and feathers on facebook and bohemian collective! I also follow her blog and on instagram... kind of obsessed! Liked roots and feathers on facebook! Also liked the bohemian collective on facebook! I really loved "sacred wings" the thunderbird and arrowhead necklace. It's gourgeous!!! Laura's pieces are amazing. I would so pick the "jade" necklace. Thanks for the giveaway! awesome! i'd pick the sierra earrings--gorgeous! I'd definitely choose the Emmalye necklace! I'm in love with-- cosmo. a geometric arrow and astral bead necklace. i liked the roots and feathers and bohemian collective fb pages. i need to own ophelia, she would look perfect hanging in my healing room! i love the stone grey periwinkle and teal earrings! i liked roots and feathers on fb! i also liked the bohemian collective on fb! I LOVE the cow skull body chain harness, it is just perfect! I adore the baswell. a long turquoise wood and arrow necklace. Also, liked both on facebook. I would definitely get "shell. a feminine ocean talisman necklace" ($58) and "avalie. a long single brass and pastel geometric earring" ($16). my favorite is the "a copper and gold geometric arrow necklace"
I'd get the "genji. a long, golden cicada necklace", "adelaine. a pair of teal and gold geometric earrings" and emmalye. a copper and gold geometric arrow necklace". I would choose eagle. a native american tribute necklace! If I'm the lucky gal, I would definitely choose ophelia, it sure will bring good dreams to me. If I was the lucky winner, I'd chose the gorgeous beaded, arrow necklace! - I've liked them on Facebook. Laura is one talented lady, she has a great vibe. Her suede headband is just gorgeous! I totally love "zuni. a native geometric teal and arrow necklace". Also liked Roots and Feathers and Bohemian Collective on FB. I love Laura's creations. They are so inspirational. If I had a chance to pick anything, it would be the pearl white boho doily vest. That treasure has been added to my favorites for a very long time. Thank you for hosting this giveaway. Merry Christmas to you & your families. I thought I liked you on FB sometime ago.. It's official now, I liked on FB, WooHoo! I love the adorn head band. So cute and unique. If I was the lucky winner I would choose this necklace http://www.etsy.com/listing/96543529/kinsey-a-mixed-metal-tribal-inspired cause I remember with this necklace my roots, the roots of my country and the Indian tribes of my country. I would have to pick Ophelia, a bohemian doily dreamcatcher <3 I love everything she makes, but I really love the doily dreamcatchers!! I like Roots and Feathers on facebook! I like the bohemian collective too! I love the ophelia doilie wall decoration! absolutely beautiful. I follow roots and feathers on facebook! Oh all of her work is simply stunning. Narrowing it down was not an easy task, but one of the four I was able to cut down to that I'm so drawn to is the "shell. a feminine ocean talisman necklace" (http://www.etsy.com/listing/116017015/shell-a-feminine-ocean-talisman-necklace). Every component of it is screaming for me to wear it. I really like the Maise or Cosmos necklace :)! I would love to win the "suri. a pair of purple and teal rustic key earrings" and "fern. a pair of evergreen and mustard beaded earrings." and "mint. a simple feminine mint colored cab ring." These designs are awesome!! I liked both pages! and the Maise. a geometric triangle necklace with turquoise and copper spikes is gorgeous. I love: spell. a long beaded deer skull necklace. The stones are so pretty! I looooove Laura's work!I like her Cosmo necklace sooo much! Thank you for this giveaway! Oo! I'd love to do some holiday shopping with that.. but for me, I like the Moonlight Warrior. Wow! I really love the Luna ring. Every time I would look at it it would be a reminder of happiness and that the world is bigger than just ourselves. I also like Roots & Feathers on FB. I have "liked" both the bohemian collective as well as roots and feathers.Out of all Laura's creations,the ones that whisper "take me" have to be the silver moon ring and the copper sun ring.The expressions on their little faces just make me smile.And since I recently lost my job,there just haven't been enough reasons to do that lately. Liked Roots and Feathers on FB.